Website and processes: 14 Sep 16 Phil R, 4/5 Good "Very easy to use website"
Most of us will at sometime have looked up on a summer's day and seen graceful turn of a sailplane high in the sky. The fascination of silent flight, seeking thermals and climbing up to the clouds is something you'll never forget. You will receive a safety briefing, explanation of the aircraft and its controls before being strapped into the cockpit. You will then enjoying the view as you are towed by a tug plane up to a height of 2,000 ft before being released and soaring for approximately 15 minutes. Your instructor will demonstrate the controls before letting you have a go at flying the glider yourself. You will then carry out three more winch launch flights, again taking control yourself. A day course is a cost effective way of gaining more airtime and allows you to enjoy a full days instruction, it includes more detailed briefings, one aerotow launch and up to three winch launches. 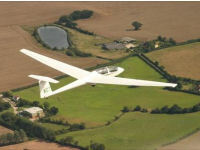 It's an ideal introduction for those considering gliding as a hobby or looking for a whole day experience. You will have to sign a health declaration. However, if you are fit enough to drive a car, you will be able to fly. Suitable arrangements can be made to overcome most disabilities. Participants will also receive one months membership of the club. Ashford, Kent TN25 4DR .